If you plan to go to Disneyland in December, go early in the month or be prepared to face some of the biggest crowds of the year. Weekdays during the first two weeks are the best time to go. Any weekend — and any weekday after that — will be very busy. If you just must visit Disneyland during this busy time because of holiday schedule constraints, you'll need all the help you can muster to survive. Start by not just reading but learning all of the proven and tested tips for staying out of line at Disneyland. Get your hotel reservation as far ahead of time as you can, too. These averages can help you get a rough idea of what the weather will be like. It's only a guideline: California weather is just like it is where you live, different every year. December is a possibly rainy month, and while Disneyland never closes because of it, a rainy day can cause rides with outdoor tracks to close. During infrequent Pacific storms, rainfall can be a downpour. At the extremes, Anaheim's record low temperature was 30°F (-1°C), and its record high was 108°F (42°C). Check the current Disneyland weather forecast a few days ahead for the best information, and check the pros and cons of visiting Disneyland visiting Disneyland in winter. December is a rainy month (in some years). Check the forecast and take a poncho or hooded rain jacket if it's predicted. Umbrellas are a nuisance to stow when you go on a ride and hard to walk around with, so leave those at home. December can be cool to chilly, especially after the sun goes down. If you want to enjoy the water rides, wear something that dries out quickly, so you don't have to walk around soggy and miserable the rest of the day. A plastic poncho will also help keep you dry while on the ride. If it all seems like too much to carry, you can rent a locker for just a couple of dollars. Besides enjoying the holiday decorations, in December you can watch a special holiday parade and fireworks, visit with Santa, or attend the annual Candlelight Processional. On New Year's Eve, there's a special "Ring in the New Year" fireworks spectacular. Use the Disneyland at Christmas guide to plan your visit and learn about what the park looks like at Christmas and what else is going on around the holiday time. While there aren't many scheduled events, Disneyland will be decorated for the holiday and you'll find lots of seasonally themed events and activities all around the parks. The Candlelight Processional is an old-fashioned homage to the season, with hundreds of singers and celebrity narrators. Open to the general public in 2012; it returned to invitation-only status in 2013. New Year's Eve brings a special fireworks show and also maximum crowds. Also in December, you can enjoy some special Christmas events, California-style. See what happens in Orange County at Christmas. The week between December 25 and January 1 is one of the year's busiest. 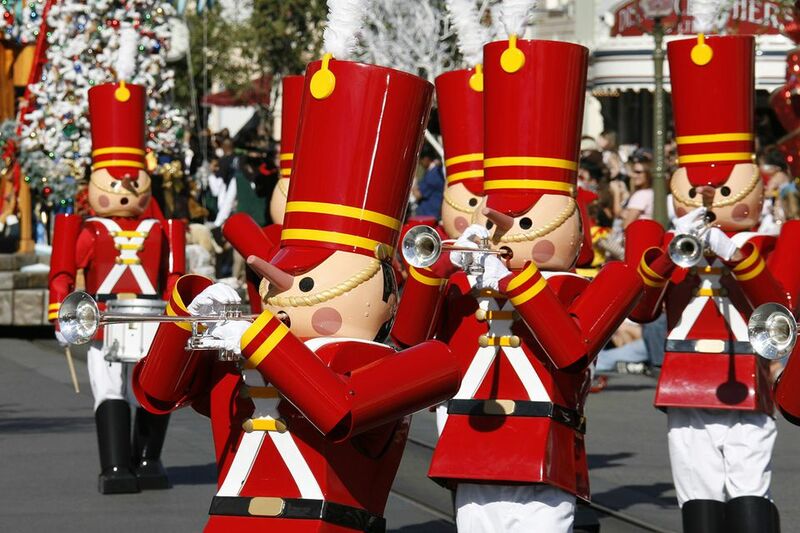 December 25 and 31 are two of the few days a year when Disneyland can get so crowded that it reaches capacity. When that happens, they have to obey the fire codes and can't let any more people in, even if they have a ticket. Use this crowd forecast calendar to get a day-by-day prediction. Tickets: You'll find it hard to get significant ticket discounts. Use the Disneyland discounts guide to find your options. Hotel Costs: Hotel rooms will be hard to find all month and discounts are unlikely. Use the guide to the best hotel rates at Disneyland to get some ideas that may help with the cost. In general, Disneyland is open 12 to 16 hours per day, every day. California Adventure's hours may be slightly shorter. This website keeps a list of which rides are expected to be closed for refurbishment.